Orange it is just so wonderful.. I use a lot of orange for baking.. This particular cake is a favourite with my mom and every couple of months or so I make it and she just loves it..
Oh and the best part it does not last for long..
1.5 teaspoon of Baking powder. Preheat the oven to a 170 degrees C. Line a spring form tin. Now cream the butter and the sugar together and gently add the eggs one by one to it. In between the addition continue to beat the mixture, then slowly sift in the flour and simultaneously keep beating to avoid forming lumps. Add the grated orange peel ( reserve some for later) about 4 table spoon of the juice and the Cointreau and finally the baking powder.. Whisk it with the beater one more time and pour it into the tin and into the preheated oven for about 40 mins.. Meanwhile take about 250 gms of dark cooking chocolate. Break them into pieces and melt them in a double boiler over slow heat.. Let it cool a bit. Then add white butter about 75 gms and mix it well to form a smooth silky rich chocolate ganache. meanwhile insert a wooden skewer into the cake to see if the batter is still sticking on to it or it come clean. If it is still sticky leave it for another 7 mins or so.. Then turn off the oven and let the cake stand for 10 mins. Bring it out and let it cool on the wire rack.. Once completely cool spread the cake top with chocolate ganache evenly and then sprinkle the the remaining orange peel. 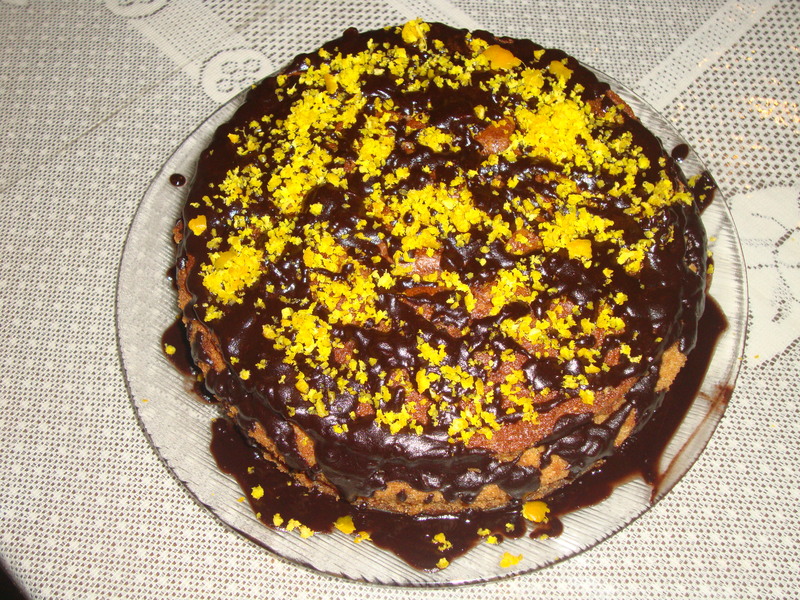 There you go.. orange Chocolate Ganache Cake..